If you have ever admired a flowering buckwheat as it clung to a coastal cliffside, brightened a mountain slope or filled a sandy wash, you might consider celebrating the genus Eriogonum in your garden. 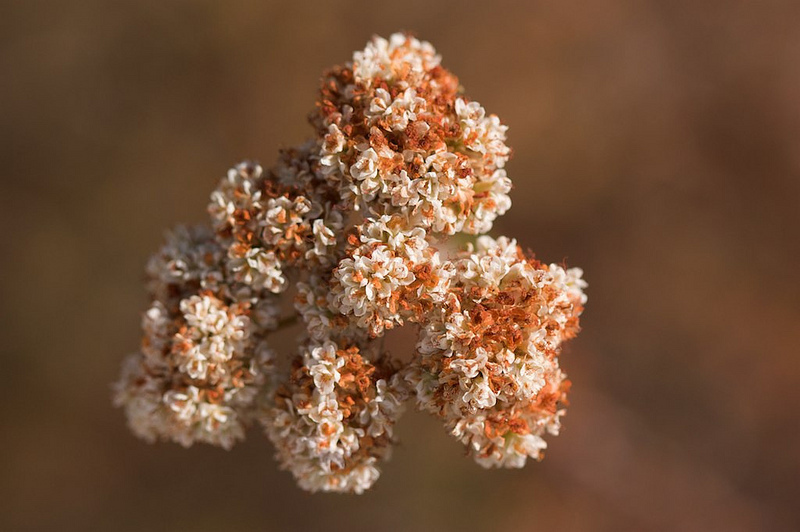 With about 125 species native to California, buckwheats range from large woody shrubs to herbaceous perennials and subshrubs and even annuals. In the wild, buckwheats favor open sunny banks and rocky hillsides; in the garden, they need sun and a well-drained sandy soil. Buckwheats bloom late in the growing season, offering fresh interest after spring and summer flowers fade. The simple leaves are often grayish green and hairy on the underside; round or flat clusters of small white, pink or yellow flowers appear at the tips of branched or radiating stalks. Bees, butterflies and other pollinators visit the flowers; birds and mammals relish the seeds. The flowers stay on the plant for many weeks, often drying to pleasing tan, cinnamon or dark brown shades. Since the stems are brittle, it’s best not to plant buckwheats where people or dogs will step on them. Two of the commonly grown buckwheats are evergreen shrubs native to the Channel Islands and so thrive in salty, windy conditions. St. Catherine’s Lace (E. giganteum) is the largest of the buckwheats, attaining a height of 4 to 8 feet and a spread of 6 to 10 feet. Its enormous, lacy white flowers mellow to a beautiful pinkish cinnamon and can be useful in dried flower arrangements. St. Catherine’s Lace may be lightly tip pruned to improve habit, but the old wood does not resprout if cut. 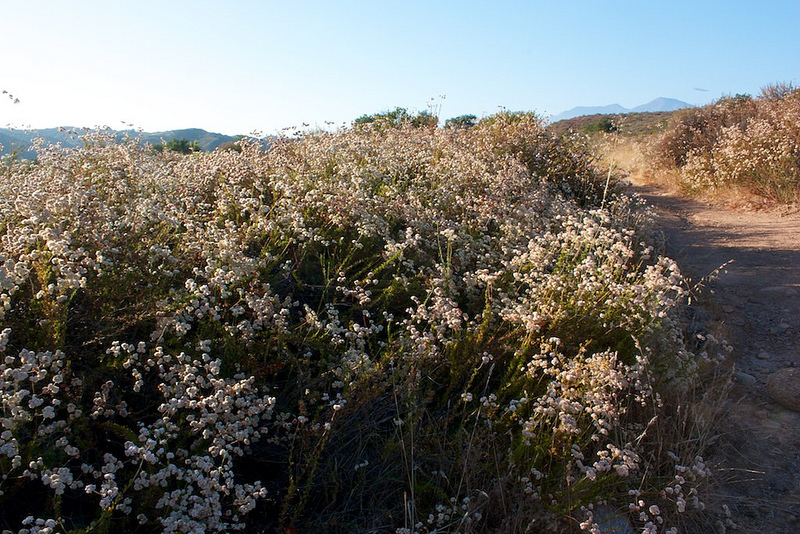 Santa Cruz Island Buckwheat ( E. arborescens) has been described as the most refined of the buckwheats. It grows to 6 feet tall with a spread of 3 to 5 feet. The flower display begins with flat clusters of pink flowers; more flowers open as the first fade to russet. As the plant matures, it displays attractive shredding bark on crooked branches. It looks especially good massed on a sunny bank with other native shrubs such as ceanothus and manzanita. It is hardy to 20 degrees. The most widespread of the shrubby buckwheats is California Buckwheat (E. fasciculatum). With needled foliage and a somewhat rangy habit, this species may not be the most classically beautiful when out of flower, but it is extremely drought tolerant and an excellent choice for erosion control. Abundant whitish or pale pink flowers virtually cover the plant, later to turn coppery brown. California buckwheat tolerates some shade and can be pruned to improve its habit. Smaller buckwheats do well in the rock garden or mixed perennial border. The northern coast buckwheat (E. latifolium), grows as a low foliage clump, 1 to 2 feet high and wide. It sends up naked flowering stalks bearing white or pale pink flowers. Similar but with dark rose-pink flowers is the red-flowering buckwheat (E. grande var. rubescens), another species associated with the Channel Islands. For best display, use this plant as filler or plant in drifts. Sulfur buckwheat (E. umbellatum var. polyanthum) is among the 20 or so species of yellow flowered buckwheats that bloom conspicuously in the mountains. It adapts quite well to garden conditions, growing with a semi-prostrate, open habit. The yellow flowers fade to reddish after bloom. Many of these buckwheats are available at local native plant nurseries and chapter plant sales. Shop now or visit public native gardens or wild areas to view the buckwheats in their flowering splendor. I share your admiration of buckwheats in the garden, and am fascinated by insect visitors who ‘shop’ there for pollen and nectar. Currently, I have E. elongatum, E. crocatum, and E. grande var. rubescens. Especially on the latter I’ve seen a number of sweat bees (Halictidae), including Halictus farinosus, Halictus tripartitus, Agapostemon texanus; a leafcutter bee, Megachile sp. Also Flower flies (Syrphidae), incl. Sphaerophoria, Allograpta, etc. Some Sphecid wasps (Sphex ichneumoneus, Isodontia elegans), and more. If you garden near native wild buckwheat populations, PLEASE take the time to research out-crossing before planting! 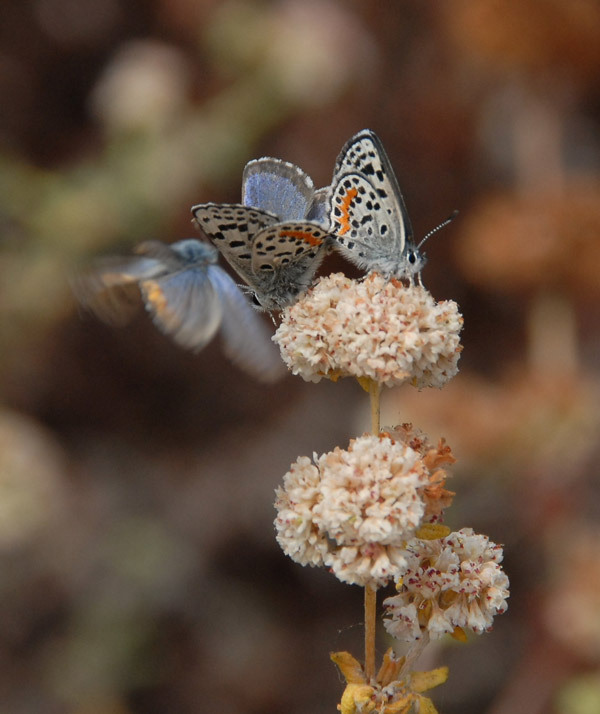 I made the mistake of planting Eriogonum latifolium in my yard, which was the home turf of Eriogonum nudum. The two species promptly crossed, apparently back-crossed, and have prodigiously set so much seed that I have not been able to eliminate the rampantly-sprouting hybrids, which continue to impact the small population of local wild Eriogonum nudum.